I was reading an article the other day about Douglas Adams, and how he pretty much ruined the comedy science fiction genre for everyone else, as most authors who enter into that realm now either comes off as a) a pale imitation of Douglas, or 2) mean, something Douglas never was, towards the genre or the audience. At the end, the author asked who among the plethora of writers working today might be the successor to Douglas's claim, and only Terry Pratchett and Neil Gaiman were offered as viable options. I would argue that both of these authors are fantasy writers, and tend to avoid science fiction, but then I'd also argue that fantasy and science fiction are really two sides to the same genre coin, and then go on further to state that I hate genre divisions entirely, and isn't it enough for it simply to be fiction, and move on? Anyway, the point. Gaiman I think has a greater claim to the title, if only through emulation. One of Gaiman's first major works was a biography of Adams, so points there. But both have written highly regarded episodes of Doctor Who (Doctor's Wife and City of Death). Both are (were) immensely pleasant people adored by not only their fan base, but recognised for their skill in the "greater public." And now, with the broadcast of Neverwhere, are part of a rather exclusive club of authors to have seen a specific work become somewhat ubiquitous among the major mediums. Radio series, check. Novel, yes. Television series on the BBC, indeed. Stage show, several. Comics books, for better or worse (mostly worse). Film, not yet for Neverwhere. Towel, Hitchhiker's still has the upper hand there. The point being, usually for an author to have experienced this level of adaptation for a specific example of their output, they've usually been dead for a century. Douglas and Neil stand nearly alone. And for good reason. Each managed to produce a piece of fiction that manages to transcend the need for medium, to have constructed a narrative that exists in a primal way, that requires and suggests no tether to a particular format, and is a proud example of that basic function of mankind: story telling. Hit the jump for the review, which contains spoilers that you can avoid by listening to the full series here. I will actually start by back tracking on a rather good and somewhat romantic point I've just made: not everything in Neverwhere makes the transition to radio perfectly. I'd consider it a remnant of it being originally developed as a TV series, and thus containing certain elements that are inherently visual. Dirk Maggs (another Adams-Gaiman connection there) has done a very good job transitioning these elements, and for the most part enhances them through the lack of visual definition. The Knight's Bridge especially, I thought was very well crafted, far superior to the original TV series. There were occasional moments meant to entice the senses, like when Richard emerges at the top of London in his early search for Old Bailey, where the sound production didn't generate enough atmosphere to allow the imagination to fill in the gaps. It is the job of the production and the actors to make us feel the distance, and it just didn't in that moment. Alternatively, there was also a general lack of intimacy, the cramped, sloped world of London Below feeling far too large and without border. The Ratspeakers, and the Floating Markets, lacked the sense of constriction those environments required. The grand finale too, I thought lacked the grandeur that makes that scene truly spectacular in the novel. It was certainly the scene that most impressed me back when I originally read the book, and the surest sign that Gaiman had this novel writing thing worked out. On the radio, however, it sounded like little more then a big Hoover. The Labyrinth was very well constructed though, with the bleeding echoes of lost moments closing in around the characters. Sadly, it all fades into the background when the Beast of London shows up, which was another element that faltered, more towards the conclusion of its appearance. It's earlier, passing mentions were better done, though the common complaint was that the TV series beast looked like not much more then a rubbish cow, so too did the radio version tend. Considering the lack of physical restrictions, I was expecting something much more audibly formidable, like the smoke monster from LOST, the beast lumbering with the sounds of eras hanging off it, the clatter of lodged weapons making a cacophony of noise. As is, it sounded just like a big, rather angry cow. Since that was what it was meant to be, good show, I suppose. But it was also meant to be a bit more then that, I thought. That all being said, Nevermore is very good. Structurally, because of its origins as a TV series, the basic shape of the series was already in place, with Maggs making slight changes as to where the action breaks, without carving the narrative up into indistinguishable pieces. And happily, it is a dialogue heavy piece, which means there is plenty for the actors to do, aside from the occasional bit of set description. As with any radio drama, the acting is what the piece relies on. Rubbish acting, and you haven't got anything worth listening to. There was little chance of this having rubbish acting. James McAvoy is reliable as Richard, more so once he becomes exasperated and lost in London Below then when he's confident and comfortable Above. Natalie Dormer takes some time to warm to the role of Door, and is at her best when acting against McAvoy then at any other time. It was well into the first episode before I felt she had established herself in the performance, but once she does, it takes off. So too of David Harewood as the Marquis, and Sophie Okonedo as Hunter, both of whom it is a couple episodes in before they really inhabit the roles. Oddly, the weakest performance I felt came from Benedict Cumberbatch as the angel Islington. Not that he didn't do a good job, just that as performed, I felt his voice was just too deep for what was expected of the role. The breathless way he played him in the early episodes did little to lower the register of his voice, so it came off more as Islington had a bit of a cold. Cumberbatch did considerably better in the final episode, when Islington is allowed to spread his wings, if you'll pardon the phrase, and let his rage come out. It is here that Cumberbatch really shines, and works best in the role. His voice is a powerful thing, as J.J. Abrams has been using to considerable effect in the promotion of Star Trek Into Darkness, but the radio show only really makes use of it at the very end. The best performances came from the supporting characters. Christopher Lee, as always was in top form, though I found it hard to accept such a commanding and authoritative voice as belonging to anyone as feeble and weak minded as The Earl. 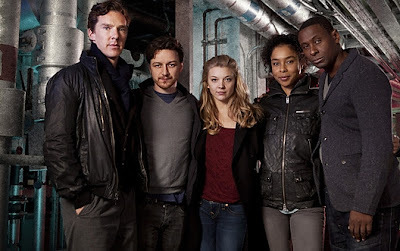 It wouldn't have solved the problem of the intended wispiness of Islington, but perhaps Lee and Cumberbatch should have swapped roles (at the very least, Neverwhere puts Cumberbatch in the running for Lee's metaphorical successor). Bernard Cribbens was a real delight as Old Bailey, and Lucy Cohu as Lamia hit her performance on the head from moment one. Odd, that the top line actors all took a bit of a run up to their roles, while the supporting cast all take off at a shot. The top performance though belongs entirely to Anthony Head and David Schofield as Croupe and Vandemar respectively, perhaps not surprisingly as they are the gleeful, Bond villains-via-the-Victorian-era characters. It would be easy to over play the characters, but Head and Schofield manage to maintain a level of discretion, and steal the show in the process. When some of the other facets of the show don't hold together as well, it is these two performances that keep everything bundled together. And happily, they never disappear from the narrative for too long a stretch of time. To conclude with my initial comparison, I wouldn't say Neverwhere was as completely successful as Maggs continuation of the Hitchhiker's trilogy. It remains however, an engrossing and enjoyable three and a half hours, and I would not object to another of Gaiman's works getting a similar treatment.